SUPERTRANSPORTATION (Ian Baxter): The four Aces and the four Kings change places among themselves. BEHAVIORAL BLUFF (Fred Robinson): A spectator picks a card among five (free choice) and you show the other four cards to be indifferent. You have predicted this card. You’ll love the method. BLANK FACES (Phil Wye): A selected card is revealed by using four double-blank cards on which messages appear. PAST HELP (Roy Walton): Four cards are selected by four spectators and then discovered by you with the assistance of four very famous magicians. Entirely self-working. SPOTTING THE SPOT (Leslie May): A card is selected and lost in the deck. A knife shown on both sides is stabbed it in the middle of the deck. The card found is blank. When you turn the knife over the pips are glued on it revealing the selection. THE CARD SHARK (Roy Walton): This shows the eating habits of killer sharks, using a selection and a card case. Commercial routine with a funny climax. 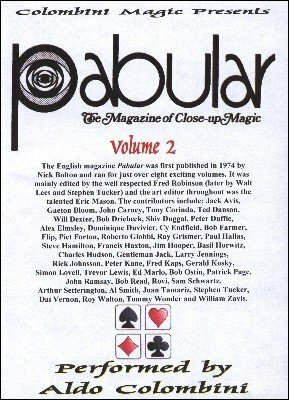 FACE UP (David Carré): A card is vanished only to reappear face up on the deck. New approach with a great vanish. HEADLINE HIT (Arthur Setterington): A double page is taken from a newspaper and torn into 16 pieces. A spectator picks one piece and you have predicted the headline on that selected piece. Clever method. SPECTATOR CUTS TO LOCATE THE ACES (Ed Marlo): The name says it all. The spectators cut the deck into four piles and find the four Aces. Very easy to do. MARKSMAN EXTRAORDINARY (Carl Herron): Two signed cards are found using your business card which is stabbed in the middle of the deck.